Gytha/Gyda, –1040–, was a daughter of Thorgils Styrbjørnsson Sprakaleggg/Sprakling and a sister of Ulf Jarl, who was married to Estrid, a daughter of Svend Tveskæg and a sister of Canute the Great. At an expedition in England Ulf was said to have had assistance from Godwin, whom he therefore protected and recommended to his brother-in-law king Canute. He soon learned about Godwin's skills, and Godwin, who had married Gytha ab. 1019, became Earl of Wessex in 1020 and the king's special counselor. Godwin was a skilled warrior, but also ingenious, knowledgeable and of character. He possessed great eloquence and an ability to win people. Gytha seems to have been his equal of character, she held sincere piety and was very charitable to the church and to the poor. Gytha shared the shifting fate of her husband. Godwin kept his power under Hardicanute and under Edward the Confessor, who married Godwin's daughter Eadgyth/ Edith in 1045. Godwin and his sons, who also were in high positions, were for a period the most distinguished governors of the kingdom. But gradually the French influence began to make an impact on the king, and when Godwin - supported by the public opinion - would not yield to this, he was banished from the country in 1051. He went with his family to Flanders. When Godwin arrived with a fleet at the coast of England and people joined him, Edward felt obliged to let him return in 1052. Godwin became ill not long after and died 15 April 1053. His son Harald/Harold inherited his position and influence and ascended the throne after Edward's death in 1066. But William of Normandy made his claim, and in the Battle of Senlac (Hastings) the same year Harold was killed together with his two brothers Leofwine and Gyrth. Gytha arrived the day after the battle to William and asked having Harold's body delivered against paying his weight in gold. Her request was rejected. Godwin's party had still after the conquest of the country a strong support from the western Shires, and during a rebellion in 1068 was Exeter, where Gytha lived, the center of the movement. The city had to surrender to William, but before the gates were opened, Gytha had escaped and sought refuge in some islets in the British Channel. She later went to Saint Omer in Flanders. According to the Anglo-Saxon Chronicle, Gytha left England after the Norman conquest, together with the wives or widows and families of other prominent Anglo-Saxons, all the Godwin family estates having been confiscated by William. Little else is known of Gytha's life or future, although it is probable that she went to Scandinavia (like her granddaughter and namesake), where she had relatives. Her surviving (and youngest) son Wulfnoth lived nearly all his life in captivity in Normandy until William the Conqueror's death in 1087. Only her eldest daughter Queen Edith (d. 1075) still held some power (however nominal) as widow of Edward the Confessor. Gytha's year of death is unknown. After Canute seized the throne in 1016, Godwin's rise was rapid. By 1018 he was an Earl, probably of eastern Wessex, and then by around 1020 of all Wessex. Between 1019 and 1023 he accompanied Canute on an expedition to Denmark, where he distinguished himself, and shortly afterwards married Gytha , the sister of the Danish Earl, Ulf, who was married to Canute's sister Estrid. 12 November 1035, Canute died. His kingdoms were divided among three rival rulers. Harold Harefoot, Canute's illegitimate son with Ælfgifu of Northhampton, seized the throne of England. 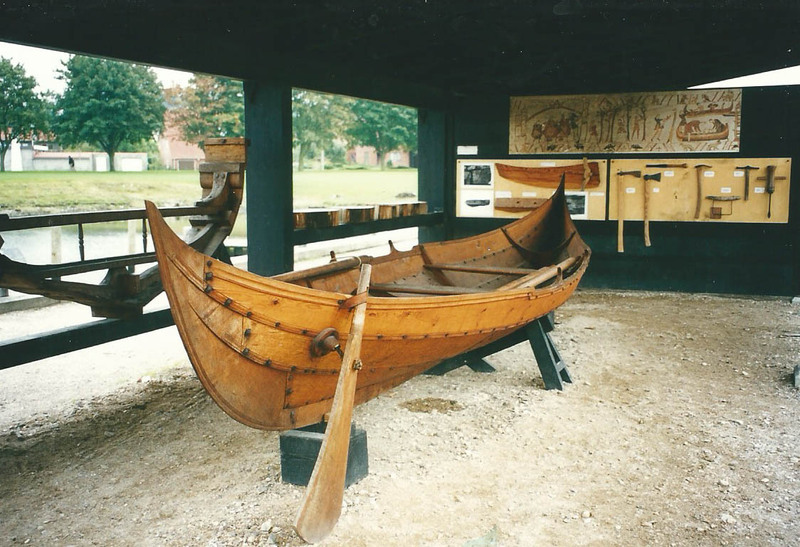 Harthacnut, Canute's legitimate son with Emma of Normandy reigned in Denmark. Norway rebelled under Magnus the Noble. In 1035, the throne of England was reportedly claimed by Alfred Ætheling, younger son of Emma of Normandy and Æthelred the Unready, and half-brother of Harthacnut. Godwin is reported to have either captured Alfred himself or to have deceived him by pretending to be his ally and then surrendering him to the forces of Harold Harefoot. Either way Alfred was blinded and soon died at Ely. In 1040, Harold Harefoot died and Godwin supported the accession of his half-brother Harthacnut to the throne of England. When Harthacnut himself died in 1042 Godwin supported the claim of Æthelred's last surviving son Edward the Confessor to the throne. Edward had spent most of the previous thirty years in Normandy. His reign restored the native royal house of Wessex to the throne of England. Despite his alleged responsibility for the death of Edward's brother Alfred, Godwin secured the marriage of his daughter Edith (Eadgyth) to Edward in 1045. As Edward drew advisors, nobles and priests from his former place of refuge in a bid to develop his own power base, Godwin soon became the leader of opposition to growing Norman influence. After a violent clash between the people of Dover and the visiting Eustace, Count of Boulogne, Edward's brother-in-law, Godwin was ordered to punish the people of Dover (as he and Leofric, Earl of Mercia had done in Worcester, in Leofric's own earldom). This time, however, Godwin refused, choosing to champion his own countrymen against a (visiting) foreign ruler and his own king. Edward saw this as a test of power, and managed to enlist the support of Siward, Earl of Northumbria and Earl Leofric. Godwin and his sons were exiled from the kingdom in September 1051. However, they returned the following year with an armed force, which gained the support of the navy, burghers, and peasants, so compelling Edward to restore his earldom. This however set a precedent to be followed by a rival earl some years later, and then by Godwin's own son in 1066. On 15 April 1053 Godwin died suddenly, after collapsing during a royal banquet at Winchester. Some colourful accounts claim that he choked on a piece of bread while denying any disloyalty to the king. However this appears to be later Norman propaganda. Contemporary accounts indicate that he just had a sudden illness, possibly a stroke. His son Harold succeeded him as Earl of Wessex, an area then covering roughly the southernmost third of England. With the death of Earl Siward (1055) and later Earl Ælfgar (1062), the children of Godwin were poised to assume sole control. Tostig was helped into the earldom of Northumbria, thus controlling the north. The Mercian earl was sidelined, especially after Harold and Tostig broke the Welsh-Mercian alliance in 1063. 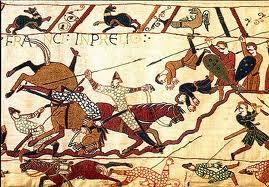 Harold later succeeded Edward the Confessor and became King of England in his own right in 1066. At this point, both Harold's remaining brothers in England were earls in their own right, Harold was himself king and in control of Wessex, and he had married the sister of Earl Edwin of Mercia and Morcar, Earl of Northumbria, (who had succeeded his brother Tostig). Godwin's family looked set to inaugurate a new royal dynasty. 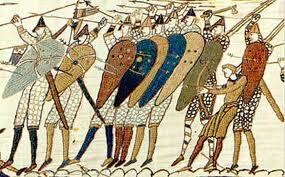 But instead Harold was overthrown and killed in the Norman Conquest. 1. Edith of Wessex (c. 1020-18 December 1075) queen consort of Edward the Confessor. 3. Sweyn Godwinson, Earl of Mercia (c. 1023 - d. 29 September 1052). 8. Alfgar, possibly a monk in Rheims. 10.Elgiva/Ælfgifu (c. 1035 - d. c. 1066). 11.Gunhilda , a nun ( c. 1035 - d. 24 August 1087). Ann Williams: The English and the Norman Conquest, 2000. Thorgils Sprakaleg was a Danish (or Swedish)? famous chieftain, whose grandsons became Kings of Denmark and England. He is also named Thrugils, Torgils, Thorkel and Torkel, while his byname Sprakaleg is found in variations: Sprakelegg, Sprakelæg, Spragelæg, Sprageleg, Sprakeleg, Sprakalägg, Sprakling and other variants. In Swedish Torgils Sprakalägg (Torkel Styrbjörnsson), in English Thorgil Sprakling. In Knytlingesaga he is called "the fast". NB: Thorgils Sprakaleg is not identical to Thorkel the Tall. His fame is mostly obvious in the status and position of his children, but there are no concrete history handed over about Thorgil's life. Saxo says in a small characteristic that Thorgils did not differ from his father's courage and masculinity. According to Florence of Worcester and Saxo Grammaticus his father's name was Bjørn (Latin Ursius) (i.e. urso, Latin for bear, björn in Scandinavian languages), but his paternal ancestry is much disputed.. There is no name of a wife (in some places on the internet is seen the name Sigrid of Halland as his wife without any source given), but it would be reasonable to assume that either his mother-in-law or his own mother was named Gytha (Gȳða), since this name was used regularly among several generations in his descendants ( the first was his daughter). Saxo Grammaticus reports legendary that this Ursius/Björn was the son of a bear and a fair Swedish maiden. The Danish historians P.F. Suhm and Jacob Langebek equate Thorgil's father Bjørn and the Swedish prince Styrbjørn or Styrbjørn the Strong, who was a son of the Swedish King Olof Bjørnsson and married to Harold Bluetooth's daughter Thyra (one of Harold Bluetooth's wives was Styrbjørn's sister). The Danish royal family in the Middle Ages (from 1047 till 1412) descended paternally from the first historical known Swedish royal family in Sweden, called Bjørn Jernsides ätt or Munsøätten, which died out on the male line around 1060. No sources support directly a relation like this, and although plausible reasons can be said as a support for the theory, there are just as many arguments against, (fx. : Saxo and the Knytlingesaga mention both Thorgils and Styrbjørn without indicating a relationship). Thorgils' children were Ulf (d. 1027), a steward and Earl of Canute the Great in Denmark, whose son became King Sweyn II of Denmark (Svend Estridsen) , Eilaf (also Earl of King Canute) and Gytha Thorgilsdatter, who was to marry Godwin, Earl of Wessex and become mother of Harold Godwinson, King of England. A few present scolars are of the opinion that Thorgils was killed in the Battle of Svold, which supposedly happened in Øresund. If so his year of death would be the year 1000, but it seems that this information builds upon a false base and might origin from * Ohlmarks Novel. It is probable that he died before 1009, since one of his sons appears as one of the leaders in the England-expedition that year - and since Thorgils always is referred to in past tense in the Sagas. It is not wrong to say that he had died, before his sons began to distinguish themselves. What makes Thorgils so interesting is that two of his children became parents of later kings, his son Ulf Jarl, Earl of England and later Jarl of Denmark, was married to Canute the Great's sister Estrid. Estrid and Ulf had among several children a son, Svend (Sweyn), who in 1047 became King of Denmark and thereby the ancestral father of the Danish medieval kings. They had also a daughter Gytha, who was married to Godwin, Earl of Wessex, whose son Harold was King of England from January till October 1066. Although he was king for only a short time and although two of his brothers were killed in the Battle of Hastings like himself (the brother Tostig was killed in the Battle at Stamford Bridge the month before), then there are today numerous descendants after Gytha and Godwin. Almost each present or earlier European royal house descend from these. ( like Valdemar the Great's mother Ingeborg of Novgorod). Another son of Thorgils was (if the informations are reliable) a son Eilaf Jarl also called Eilif, Ejlif, Ejlaf and Eglaf, who is mentioned in different contexts with his brother Ulf. He took part in several expeditions and signed various diplomas in the 1020s, although the family ties are not mentioned at these occassions. The name Thorgils does not seem to have been used often by the descendants. In various sources is only one occurrence of a descendant named after Thorgils, one of Svend Estridsen's many sons, who thus was a great-grandchild of Thorgils Sprakaleg. He later settled in the East, at Gardarike, according to Knytlingesaga. The Scania writer *Åke Ohlmarks let in his novel-saga Konungariket Skånes Undergång from 1975 Thorgils Sprakalägg be the last king (989-1000) of the independent Scania kingdom. Thorgils is in this story son of Toke Gormsson, a son of Gorm Skåning and a son's son of Guldharald. Ohlmark let Thorgils be married to a woman named Ragnfrid. In Claus Deleuran's cartoon-version of Danmarkshistorien "Illustreret Danmarkshistorie for folket", is a drawing of a young Thorgils together with his father Bjørn. Danske vikingekonger - én slægt med mange grene, April 2011. Ulf Jarl, Dansk biografisk lexicon, Carl Frederik Bricka. Mstislav I of Kiev is a rather special link. Through Euphrosyne (his daughter in second marriage) he is an ancestor of King Edward III of England and hence all subsequent English and British monarchs. Through his mother Gytha he is part of a link between Harold II of England and the modern line of English kings founded by William the Conqueror who deposed him. 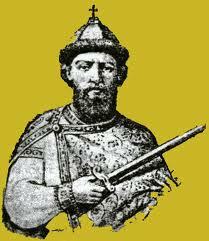 His full name and title is Mstislav I Vladimirovich the Great, Grand Prince of Kiev from 1125-1132. He was born on June 1, 1076 in Turov and died in Kiev on April 14, 1132. Mstislav was the eldest son of Vladimir II Monomakh by Gytha of Wessex. He is mentioned in the Norse Sagas under the name Harald, taken to allude to his grandfather Harold II of England. Being the eldest son Mstislav was his father's future successor. He reigned in Novgorod from 1088-93 and from 1095-1117. Later he was his father co-ruler in Kiev and inherited the Kievan throne after his death. Mstislav built several churches in Novgorod, Sct. Nicholas cathedral ( 1113) and the cathedral of St. Anthony cloister (1117), both survive to the present day. Sct. Nicholas was situated near his palace at Yaroslav's Court, Novgorod, the church contains 12th century frescoes which illustrates his family. 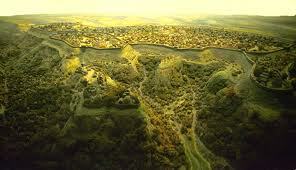 He also built important churches in Kiev, fx.his family sepulchre and the Church of our Lady. Mstislav was constantly at war from the year 1093 until about 1131, either with the Cumans or the Estonians, the Lithuanians and Polotsk, he also defeated his uncle Oleg of Chernigov, which caused enmity between his and Oleg's descendants. Mstislav was the last ruler of united Rus, and upon his death "the land of Rus was torn apart" - which was said by a chronicler. There is not much information about his first wife, Christina Ingesdotter of Sweden. She was married to Mstislav in 1095 and she died on January 18 1122. Three years after her death, Mstislav became Grand Prince of Kiev. Later in 1122 Mstislav married Liubava Dmitrievna, the daughter of Dmitry Zavidich, a nobleman of Novgorod. Their children were: Vladimir III Mstislavich ( 1132-1171) and Euphrosyne of Kiev (c. 1130- c 1193), she married king Geza of Hungary in 1146. Ingeborg, Malmfred, Eupraxia, Vsevolod, Maria, Iziaslav, Rostislav, Sviatopolk, Rogneda, Xenia. The first child and eldest daughter was Ingeborg. She is called Ingeborg of Kiev, Ingeborg of Novgorod or Ingeborg of Rusland. She married Knud (Lavard), the only legitimate son of king Erik I Ejegod of Denmark and Bodil Thrugotsdatter. Ingeborg and Knud had three daugthers and in 1131 they had a son Valdemar, who was born a week after his father's murder in Haraldsted forest. The boy was named after his grandfather Vladimir II Monomakh, and this was the first time the name Valdemar was used in Denmark. 4. Valdemar I of Denmark (born 1131). Please see posts about Ingeborg and Knud Lavard and their daughters elsewhere in this blog. There is also an article in the Thyra-blog about Knud's murder (search Knud Eriksson Lavard). Ingeborg's sister Malmfred was married to king Sigurd I of Norway (Sigurd Jorsalfar) and later to Erik II Emune of Denmark. She was married to Sigurd between 1116-1120, he was king of Norway from 1103-1130. In 1098 Sigurd accompanied his father king Magnus II to the Orkney Island, Hebrides and the Irish sea. He was made earl of Orkney the same year. A very young earl. Since he is 14 years old in 1103, he was only 9 years old. It is not certain whether Sigurd returned home with his father to Norway after the 1098 expedition; however, it is known that he was in Orkney when Magnus returned west in 1102 for his next expedition. A marriage alliance was negotiated between Magnus and an Irish princess, and Sigurd was to marry her sister, princess Blathmin O´Brien. However, when Magnus was ambushed and killed in Ulaid by an Irish army in 1103, the 14-year-old Sigurd returned to Norway along with the rest of the Norwegian army, leaving his child-bride behind, and became king together with his brothers Øystein and Olav. Upon arriving home back in Norway, he and his two brothers were proclaimed kings of Norway and would co-rule the kingdom together for some time. When he married Malmfred he was ab. 27 years of age. Sigurd died in 1130 and was buried in Hallvard's church (Hallvardskirken) in Oslo. Sigurd and Malmfred had a daughter, Kristin Sigurdsdatter, (mother of king Magnus V of Norway) but no legitimate sons. This led to a power struggle following Sigurd's death between various illegitimate sons and other royal pretenders, which escalated into a lengthy and devastating civil war. Tradition say the marriage was unhappy. Malmfred's husband repudiated her in 1128 and remarried a certain Cecilia. In 1130 her ex-husband's illegitimate son Magnus IV Sigurdsson became king and Malmfred left for Denmark, were she married Prince Erik Emune (king Erik II). In 1131, she arranged the marriage between her former stepson Magnus IV of Norway to her sister's daughter, princess Christine of Denmark, (daughter of Ingeborg and Knud Lavard) , they were married in 1133. Christine's husband king Magnus supported the struggle of Malmfred, Erik Emune and Christine's father, Knud Lavard, against King Niels of Denmark. In 1133, Erik Emune and Malmfred fled Denmark for Norway and the protection of Magnus. After Queen Christine, however, found out that Magnus had plans to betray them, she warned them and Erik Emune and Malmfred allied themselwes with the rival of king Magnus, king Harald IV of Norway. King Magnus then separated from queen Christine. In 1134, Erik Emune became king, and Malmfred queen of Denmark. She had no more children. In 1137, her second husband was murdered. Malmfred is not mentioned after this date. Malmfred and Sigurd had a daughter: Kristin Sigurdsdatter, she was the wife of Erling Skakke and the mother of king Magnus V of Norway. Is mentioned as Eupraxia-Dobrodjeja of Kiev in the information about her husband Alexios Komnenos, latinised as Alexius Comnenus, but the identity of his wife is said to be uncertain. It is possible he was married twice, the first wife being Dobrodjeja Mstislavna of Kiev, (= Eupraxia, which presumably is her Orthodox baptismal name), a daughter of Mstislav of Kiev, and the second being Kata of Georgia, a daughter of David IV of Georgia. While both women are known to have married members of the Komnenoi-family, several theories have been suggested as to the identities of their husband or husbands. Alexios was the eldest son of the Byzantine emperor John II Komnenos and his wife Eirene of Hungary. He was born in February 1106 at Balabista in Macedonia, was made co-emperor with his father at 16 or 17 years of age and died on the 2nd August 1142 at Attalia, Pamphylia. He was an elder brother of the emperor Manuel I Komnenos and had a twin sister, Maria Komnene (plus other siblings). The coverage of his life is very sparse. Eupraxia died c. 1136. Vsevolod Mstislavich, the patron saint of the city of Pskov, ruled as Prince of Novgorod in 1117–32, Prince of Pereslavl (1132) and Prince of Pskov in 1137–38. He was the eldest son of Mstislav and Christina. He was born in Novgorod during his father's reign as prince there (1088-93), (1095-1117) and was given the baptismal name Gabriel, or Gavriil. The date of his birth is unknown. He was enthroned as Prince of Novgorod after his father Mistislav became Grand Prince of Kiev in 1117 and ruled Novgorod, with some interruption, until he was ousted by the Novgorodians in 1136. 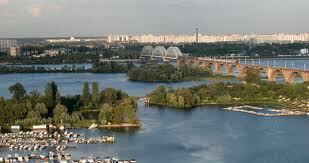 He was married to a Chernigovian princess in Novgorod in 1123 and his son, Ivan, was born there (Ivan died in 1128). Vsevolod died in February 1138. According to his own wishes, he was buried in the Church of St. Demetrius in Pskov. the Church of St. George in the Market (1133), the Church of The Assumption in the Market (1133); and the Church of St. George in the Yuriev Monastery. The Cathedral of St. Nicholas in Yaroslav's Court, while often attributed to his father Mstislav, was mostly built during Vsevolod's tenure in Novgorod. Vsevolod's comparatively early death prevented him from claiming the Kievan throne. He was survived by a daughter, Wierzchoslawa, the wife of Boleslaw IV the Curly. Prince Vsevolod was canonized by the Russian Orthodox church as Vsevolod-Gavriil. In the Stepennaya Kniga (the "Book of Degrees of Royal Genealogy"), he is listed as a Pskov Wonderworker. 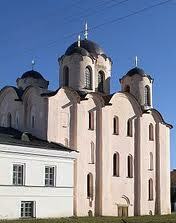 His relics were moved from the Church of St. Demetrius to the Trinity Cathedral in the Pskov Kremlin in 1193. The Pskovians attached his name to a German sword with the inscription honorem meum nemini dabo, formerly preserved in the cathedral sacristy, but modern historians date the sword to the 15th century at the earliest. 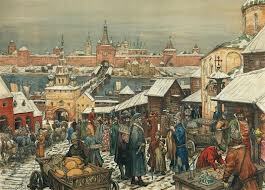 Vsevolod married in 1123 in Novgorod a Chernigovian princess who was an unnamed daughter of Svjatoslav Davidovich. 2. Wierzchoslawa Wsewolodna (ab. 1124- 14 March 1158). She married in 1137 Boleslaw IV the Curly High duke of Poland. Maria's husband Vsevolod (marriage between 1116-1125) was the prince (Knyaz) of Chernigov (1127-1139) and Grand prince (Velikiy Knyaz) of Kiev 1139-1146, he was a son of Oleg Svyatoslavich, prince of Chernigov. Vsevolod died August 1., 1146. Though he had two sons, Vsevolod's chosen successor was his brother, Igor, and he obtained pledges from his subjects to accept Igor as his heir. According to one account, Vsevolod even had the Kievans kiss the Holy Cross and swear loyalty to Igor, which they resented. Shortly before his death, Vsevolod became a monk under the name Gavriil. Maria died 1179. 3. Anna of Chernigov, married a prince of Galicia, according to some chronicles. 4. Zvenislava of Chernigov, married Boleslaw I the Tall, duke of Wroclaw. 2) Anonymus daughter of Demetrius I of Georgia. Iziaslav II Mstislavich ( c. 1097-13 november 1154), prince of Pereyslav 1132, prince of Turov 1132-1134, prince of Rostov 1143- , prince of Vladimir and Volyn 1134-1142, Pereyslavl 1143-1145, Grand prince (Velikiy Kniaz) of Kiev 1146-1149 and 1151-1154. He was a son of Mstislav I and Christina of Sweden . His first wife was Agnes, a daughter of king Conrad III of Germany. She took the name Liubava after her marriage. She died in 1151. 4. Evdokia, married Mieszko II the Old, High duke of Poland. Iziaslav's second wife was an anonymous daughter of King Demetrius I of Georgia, but they were married for only a few months in 1154 before his death. Sviatopolk, prince of Pskov 1138-40, prince of Novgorod 1142-48, prince of Volynia 1148-54, he died in 1154. He was married between 13/12 1143 and 6/1 1144 to Euphemia of Moravia. She was born 1115, died after 1144. Rogneda Mstislavna Rurik of Kiev was born circa 1111 to Mstislav I of Kiev and Christina of Sweden. She died c. 1158 of unspecified causes. She married Jaroslav/Yaroslav of Turov/Volynia (c1091-1123). Xenia was the last child of Mstislav and Christina. She married in 1125 Briachislav of Izyaslavl. Xenia died after 1129. Christine Ingesdotter of Sweden died on January 18, 1122; later that year Mstislav married again to Liubava Dmitrievna, (+ after 1168) the daughter of Dmitry Zavidich, a nobleman of Novgorod. Euphrosyne was the eleventh child of Mstislav and the first daughter of Mstislav and his second wife Liubava Dmitrievna. In 1146 Euphrosyne married king Géza II of Hungary, who had come of age shortly before. During her husband's reign Euphrosyne did not intervene in the politics of the kingdom, but after his death on 31 May 1162, her influence strengthened over their son, king Stephen III. The young king had to struggle against his uncles Ladislaus and Stephen to save his throne, and Euphrosyne took an active part in the struggles. She persuaded King Lladislaus II of Bohemia to give military assistance to her son against the invasion of the Emperor Manuel I Komnenos. Euphrosyne's favourite son was the youngest, Duke Géza of Hungary. When King Stephen III died on 4 March 1172, she was planning to ensure his succession against her older son Béla, who had been living in the court of the Emperor Manuel I Komnenos. However, Béla came back, and he was crowned on 13 January 1173, although the achbishop Lukács of Esztergom denied his coronation. Shortly after, King Béla III arrested his brother, which increased the tension between Euphrosyne and her son. 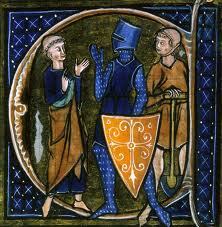 Duke Géza soon managed to escape, probably with Euphrosyne's help, but in 1177 he was again arrested. In 1186, Euphrosyne tried to release her younger son again, but she failed. King Béla III ordered the arrest of Euphrosyne and kept her confined in the fortress of Barancs (Serbian Branicevo). 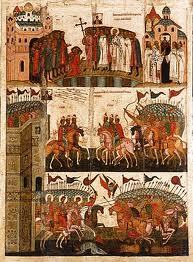 Shortly after, Euphrosyne was set free, but she was obliged to leave the kingdom for Constantinople. From Constantinople she moved to Jerusalem where she lived as a nun in the convent of the Hospitallers, and then in the Basilian monastery of Saint Sabbas. 6. Helena (c. 1158 - 25 May 1199) wife of duke Leopold V of Austria. Eyuphrosyne is the ancestress of Edward III of England and hence the ancestor of all subsequent English and British monarchs. She is also part of a link connecting the line of Harold Godwinson and the modern line of British monarchs. 1) daughter of Serbias Belos Vukanovich. Vladimir III Mstislavich (1132–1173), Prince of Dorogobuzh (1150–1154, 1170–1171), Vladimir and Volyn (1154–1157), Slutsk (1162), Tripolye (1162–1168) and Grand prince of Kiev (1171). He was the son of Mstislav I of Kiev and his second wife Liubava. Due to his brief rule he is omitted from some lists of the princes of Kiev. He kept excellent ties with Hungary and Serbia. In 1150 he married the daughter of Serbia's Belos Vukanovic. According to old Russian annals, her titular name was enscribed as "Banovna". Grubbe, who later married hr. Johan Olufsen Bjørn. C. Christensen, Hørsholms Hist. S. 4 f.
a) Lage Grummesen Saltensee, ment. in Ørum in Fjends herred 1360. Son: b) Hr. Jep Lagesen Saltensee of Staarupgård (ment. 1377-1410), m. to Edel Christiernsdatter Munk from an old family with a Mursnit (brickwork) in their coat of arms, of Koustrup in Thy. Son: c) Lage Jepsen Saltensee of Staarupgård (ment.1401-38), m. to Ide Iversdatter Juel of Daubjergård, from the family Juel with a star in their coat of arms, a daughter of Iver Juel of Øgelstrup and Astrup, (ment. 1421,d. 1468) and first wife Mette Lauridsdatter Hvas of Ormstrup, whose mother was a Strangesen. Iver Juels father was rigsråd Jens Pallesen Juel of Øgelstrup (ment. 1410-28), m. to Karen Christiernsdatter Fasti. Strange Nielsen Strangesen and Ebbe Strangesen. Holstein in 1470 and at the Kalmar-meetings 1472,73,74 and 76.
the banner into the hands of the Swedes. this last date fru Anne is mentioned as his widow. Danmarks Adels Aarbog 1888, S. 64 f.; 1897, S. 488 f.
Strangesen, Ebbe, –1507, Rigsraad, was a son of Strange Nielsen. a vasal at Ørum 1497 and still in 1504. Poul Laxmand struck both him and E.S. with his sword. Kalmar in 1505), but he never became never a ridder. again to Henneke Ahlefeldt Benedictsen. Danmarks Adels Aarbog 1888, S. 65.
these indirectly to all the Danish nobility from the 16th and 17th century. of arms of the Lunges. 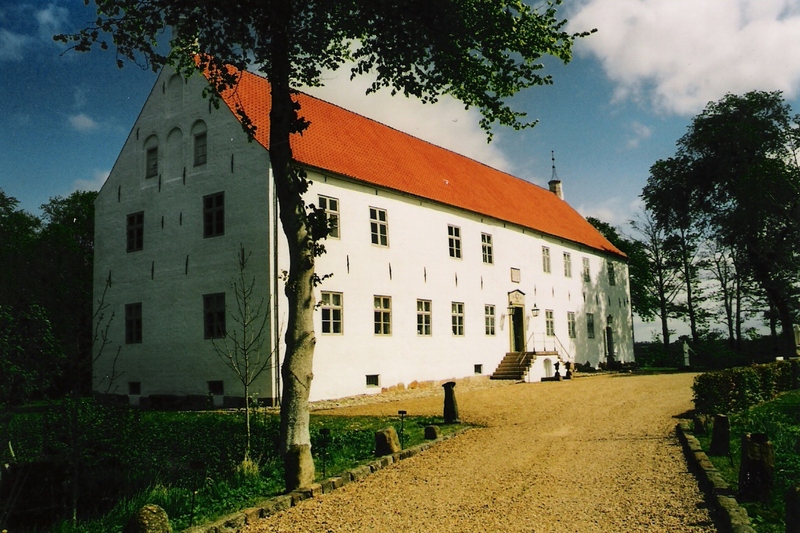 Olufsen of "Tiufstorp"; he had in 1285 authority by the dean in Roskilde, mag. 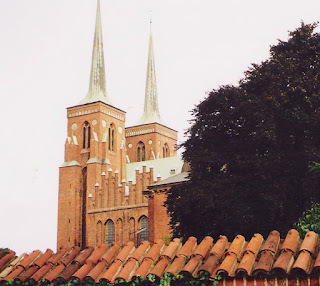 Roskilde in Bjernede and Fodby, and he conveyed and pawned estate to St.
in 1290 and witnessed a signature with the civilian Niels Hermansen. Oluf Lunge was dead in 1302, while his widow still lived. 3. Margrethe Lunge, + after 1335. Saltofte etc. which was pawed to him by Anders Nielsen and hr. probably Patriciens in Roskilde, at least they were connected to this city. and Jacob Olufsen had the estate of the bishopric in Fodby as a vasalry. rising the Lunge name to the highest esteem. his indignation both J.O.and several other magnates sent into prison. Queen Margrethe's efforts to restrict the growing power of the nobility. 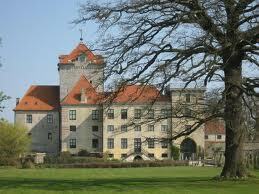 estate he had been the owner of Hegnet (Salling) which he sold in 1382. 1) Maren Myndel of Nielstrup and Adserstrup. 2) Elsebe Sandberg. Assendrup calls Jacob's son Ove Lunge his sister's son in a letter. daughters, there is information about Anders, Folmer and Niels. Anders was said to be a knight already then and a prominent man. A. J. Grim. A.J.L. is mentioned the first time in a document from 1382. In 1388 he was still a væbner , but in 1390 he became a knight. or his way of work. had had for a short time in the Danish nobility. were Rythe (Rygaard) and Tvede. March 1413 his wife Elisabeth Hansdatter (Podebusk) is a widow. 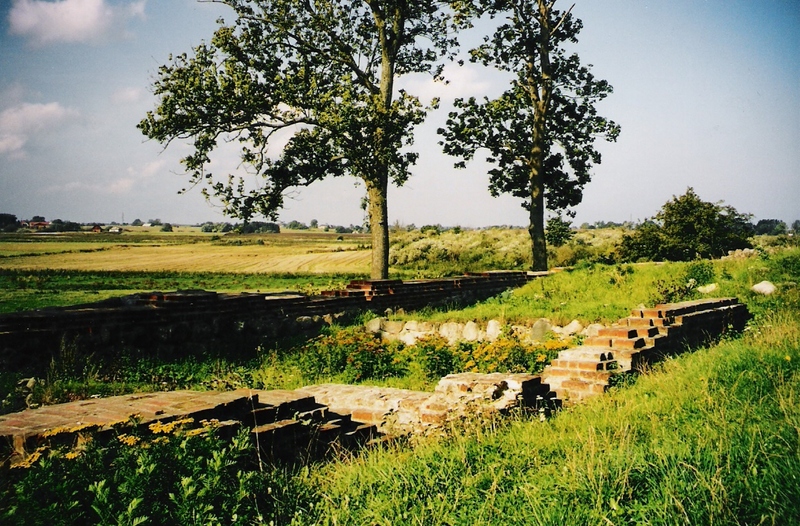 Lunge, is mentioned as a cannon in Roskilde in 1387 and still in 1401. Strengnæs. His later life is unknown. Kr. Erslev, Dronn. Margrethe S. 255. 483.
had a high office in the royalty - as "Camerarius" at king Erik Glipping. He was the king's only companion in the night of the 22. november 1286, when the conspirators broke into Finderup lade. "Although naked and unarmed he fought the killers" says a writing from that time, but according to the folk ballad he had instead of locking the door only "placed two straws". "han hug i borde og balk" (he hug his sword in the table") and protected his master as a skalk (as a traitor). The public opinion was that Rane was the helper of the conspirators, and in the Danehof (the Danish court meeting) at Nyborg (castle) at Pentecost 1287 was Rane condemned an outlaw like the other king killers. He probably fled together with them to Norway; he was among those who was given protection by the Norwegian king Erik Præstehader (Priesthater), and he took part in the expeditions of the outlaws to Denmark. In 1294 he was careless, he came to Roskilde and was caught there and put on the wheel outside the town. The Danish folk ballads deals much with Rane Jonsen. A ballad tells how he when outlaw seizes a bride, another song from the Middle Ages sings about his capture and execution. "The king was hunting in the area west of Viborg. When it was growing dark, he went with a small entourage - among these Rane Jonsen - to the village Finderup and he found a primitive lodging for the night in the church barn. There was still candle light in the room, when some men with covered faces knocked down the door, forced their way in and turned out the lights. Rane Jonsen was confused and fought them although he was naked and unarmed. But when the oproar was over and the masked men were out in the dark again, king Erik lay dead by 56 stabs of which one was under the belt. It will never be solved, who the masked men were. Except one unknown knight among the magnates, who were condemned the next year - among those Rane Jonsen and rigets Marsk (the marsk of the kingdom) Stig Andersen. Marsk Stig belonged to the Jutland part of the Hvide-family and many from this family were among the condemned. But also the Halland side-line of the royal family were among the condemned: Jacob of Nørrehalland and Peder Jacobsen and Niels." Rane Jonsen was the owner of Gjorslev (Stevns Herred, Sjælland. ), he was Kong Erik Glippings Kammermester (actually a finance-minister), took part in the regicide in Finderup in 1286 and was in 1287 with the other king killers condemned outlaw at the Danehof in Nyborg in 1287, had the same year a protection-letter from the Norwegian king, was 1294 captured in Niels Broks Gård in Roskilde and put on the wheel near Roskilde; from his forbidden Jutland estates was established a vasalry. Tho’ friends he had no more. For friends he had no more. As he has long been taught. “Such trouble on him bring! “And there in safety lain! “Her path of duty show! “O Christ, look on my children dear! “O comfort thou their woe!